We gave away small footballs (in honor of The Vikings Reader and Gophers Illustrated), posters and a prize drawing for a selection of Italian-appetizer starters (in honor of Never Trust a Thin Cook). 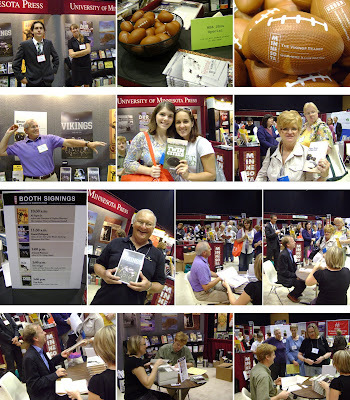 Featured in these photos are the book fans, Press staffers (including exhibits coordinator Erik Anderson and marketing assistant Alyssa Lochner, top left; and publicist Heather Skinner, assisting with author signings) and authors (signings with Armand Peterson, The Vikings Reader; Eric Dregni, Never Trust a Thin Cook; and Greg Brick, Subterranean Twin Cities) who helped make these booth events possible. Read more about this busy event and the booksellers' favorite titles in Publishers Weekly.